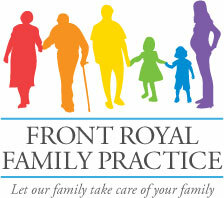 Front Royal Family Practice has contracted with Follow My Health to provide their patients with a complete online personal health record experience. Follow My Health is free to patients. Log on at any time to review your information. You may also decide to receive email and/or text notifications when information is revised or added to your account. Select “My Account,” then “Preferences” and customize your notification settings to meet your needs. Our Follow My Health Patient Portal can be accessed from any computer, tablet or mobile device with an Internet connection. It is supported by the following web browsers: Internet Explorer 8.0 or higher; Mozilla Firefox ; Google Chrome; Safari. The Follow My Health application is also available for iOS and Android devices. How do I set up a Follow My Health account? Sign-up is simple and takes place when patients arrive for provider appointment. There are two ways to sign up. Patients can provide us with their email account and we will send them an email invitation with a link. Or, patients can go directly to our website and ask to add an account. This request comes to the practice to be accepted and may take 2-3 days to be activated. Proxy accounts for minors or adult proxy account must be taken care of at an office appointment since we must fill out a proxy permission form. If there is a custody issue, guardians need to bring custody paperwork to the visit. Once you sign up, watch for an email from noreply@followmyhealth.com within a few business days. Click the registration link to complete the process. What if I don’t receive the invitation email? To ensure that the Follow My Health invitation email reaches you, please check your “spam folder” and add noreply@followmyhealth.com as an approved sender. Log on whenever you want to review changes, make updates, request appointments and more. Bookmark the site to make it convenient to visit on a regular basis. You may also decide to receive email and/or text notifications when information is revised or added to your account. Select “My Account,” then “Preferences” and customize your notification settings to meet your needs. How can I access my child’s or other family member’s health information? If you are interested in a Follow My Health access for your child(ren) or an adult for whom you are legally responsible and that individual is a patient of a participating provider, you will need to sign up in person by completing a Patient-Designated Personal Representative Access Request form. Only you – and those you authorize – will be able to see or gain access to the information in your portal. You can give others proxy approval by completing the proxy approval steps available once you log into your account. What if I don’t receive my invitation email? You may either call and confirm your email address with us and ask for a new invitation, or you can request access directly from the link on this website. If you don’t remember your password, choose FMH Secure Login, enter your username and select “Reset.” You will then receive an email with instructions about how to complete this process. If you originally signed up using another account (Facebook, Google, Yahoo or LiveID), select the appropriate icon and follow the instructions. Please note: If you request three password resets in a 24-hour period and do not reset the password, this option will be locked for 24 hours. Call our office at (540) 631-3700 for assistance. Yes, your personal and medical information in the MyHealth portal will be kept confidential. MyHealth uses a secure, encrypted connection that meets the highest industry standards. All health data is stored on a secure server. Only you – and those you authorize – will be able to see or gain access to the information in your portal. We will not share your personal information with any outside party not affiliated with our organization.